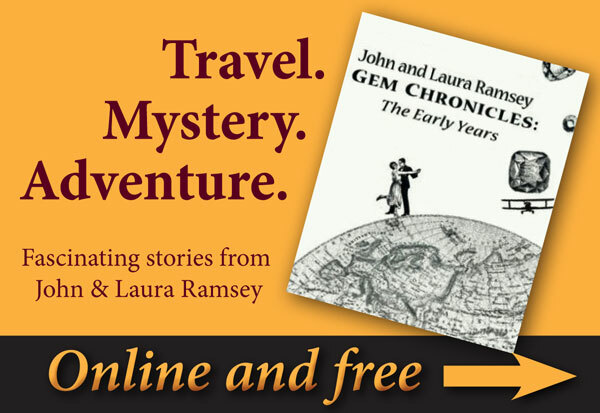 John and Laura Ramsey Write: Speaking of Unobtainium….. The gem in the photo is pretty much the ultimate Santa Maria Aquamarine. A few years ago this stone came into our hands—literally—and amazed us all. A fellow I know in Brasil owns one of the mines in the mining district which produces the Santa Maria Aquamarine of fame. He made this stone available and WOW what a stone! It is about 11+ carats and about the most intense aquamarine blue we’ve seen to date. Now, that being said there is a pretty wide range of color produced from those mines down to some colors more normally found in the aquamarine range. Natural products are like that: unique gifts from Nature all according to what was happening in the Earth at the time. If that stone were available in today’s current market it would be for sale for many times the asking price of when it was produced. Why??? There was production back then and several mines and miners were active. Since then many have given up. Mines in that mining district seem to be a lot like slot machines. Put the money in and you may or may not get a reward. Many times we’ve heard about miners giving up after running out of capital and the next guy in at the mine hits a big pocket of gems right after he starts up. What a business…. 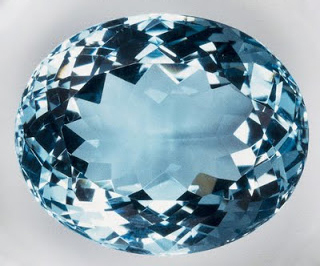 One of the most elusive gems listed as a birthstone is aquamarine. March babies are lucky to have such a wonderful gem as their birthstone on the one hand yet true aquamarine can be difficult and many times very expensive to acquire. You will find in the accompanying picture one lot of cut aquamarine in the manner often used by dealers to show to other dealers in loose gems. Note the distance between gems—to keep chipping from happening. Note the different cuts in the lot. Gem rough is so rare and expensive that gems have to be cut according to the piece of rough the cutter is fashioning from rough to cut. The color of this lot is exceptional. Years ago this was a fairly normal (never common) sight in the great aqua mining regions of Brazil. Not so much anymore. The size of the pieces is also, always a big issue. Smaller aqua gems like smaller diamonds are always much more in supply than larger stones. 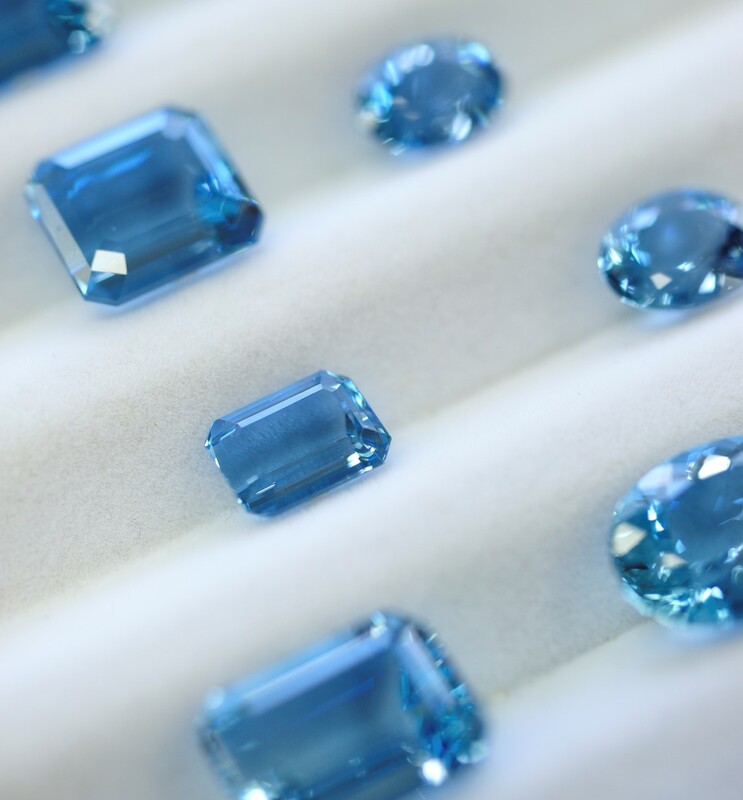 Smaller aqua gems are currently available enough that they can be cut into calibrated stones which will fit into standard mountings or in mountings produced in quantity. Calibration is done in millimeters (the gem business being international uses the metric system). Smaller and popular calibrated sizes include 6x4mm, 7x5mm and 8x6mm. 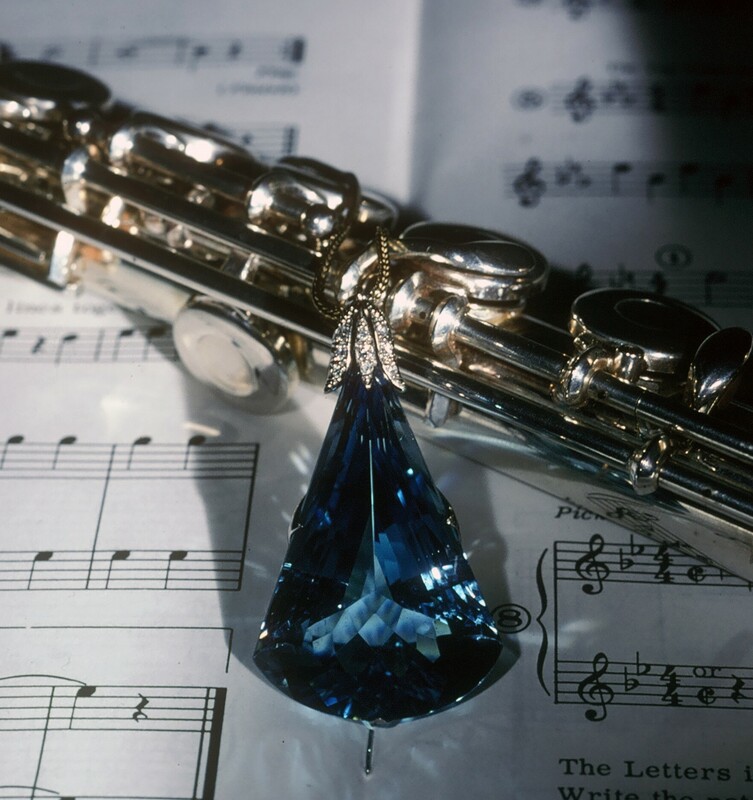 We, at Gems At Large, have been amongst the few who have produced calibrated aquamarine in larger sizes. For many of our larger more exotic rings and pendants we have produced calibrated aqua up to 20x15mm (about ¾ of an inch by just over ½ of an inch). During the past few years however the rough to produce the larger calibrated sizes has just not been coming out of the Brazilian mines. Buying colored stones teaches a person about seizing an opportunity. What we can buy and sell this year may not be available next year. Aquamarine is truly an example of this phenomenon. When great aqua is available and at a fair price—we know to jump all over it!!! One of the most fun things I can imagine is buying gems in the rough uncut form. In the picture you can see a fabulous rough aquamarine crystal. In this case we’re talking about a piece almost 5 kilos in weight (11 pounds), about 20 inches tall and its worth (? )—priceless as a work of nature’s art. Not all rough aqua is this large, fabulous and crystal clear but when it is what a treasure to behold! Not all that long ago I was offered a parcel of rough (known in the trade as a “lot”) —also aquamarine—but even darker blue with wonderful crystal shapes. Some of the pieces in this lot were acid etched by acidified water in the surrounding soil. 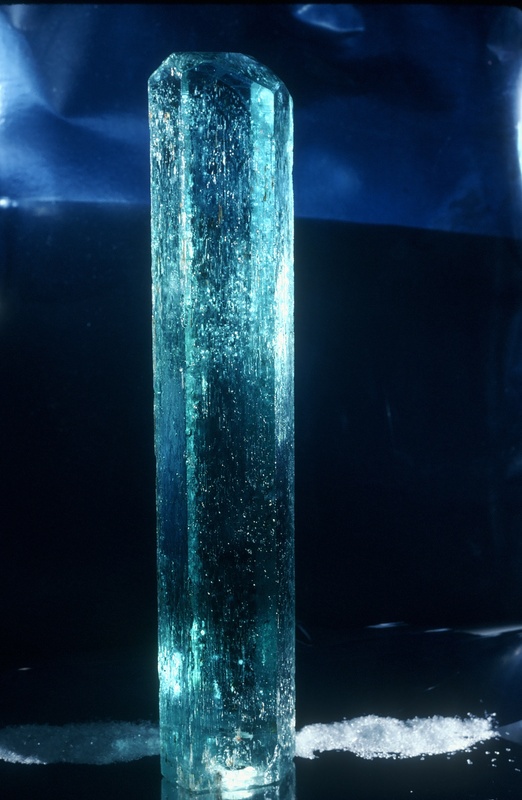 Acid etched crystals are often very shiny and can have curious shapes as compared with the more classic crystal form of aquamarine. 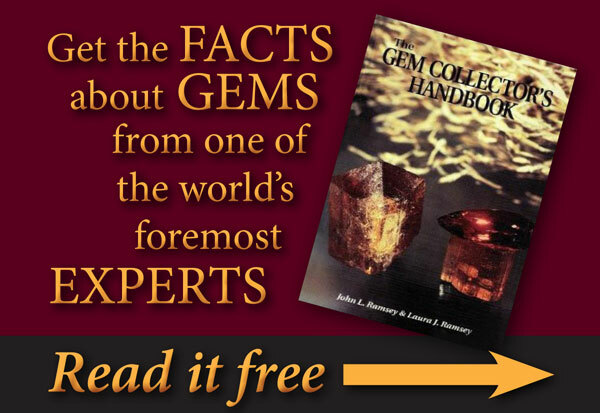 It is unimaginably exciting to find a lot of rough gem material offered that I know, as a gem cutter, will cut into large, clean, top color gems—what a thrill that is. The best way to share this is to be able to pass them on to collector clients as the finished piece—either as a loose gem or in a piece of Laura designed jewelry. There are some things which are too exciting to sit around and wait to talk about. Aqua for March is one such item. If you’re one of the millions of people who saw James Cameron’s Avatar you might recall that what the bad guys are after is called “unobtanium.” Unobtainium (note the different spelling)* has been used in literature as “any fictional, extremely rare, costly, or impossible material.” This last definition according to the Wikipedia online encyclopedia. 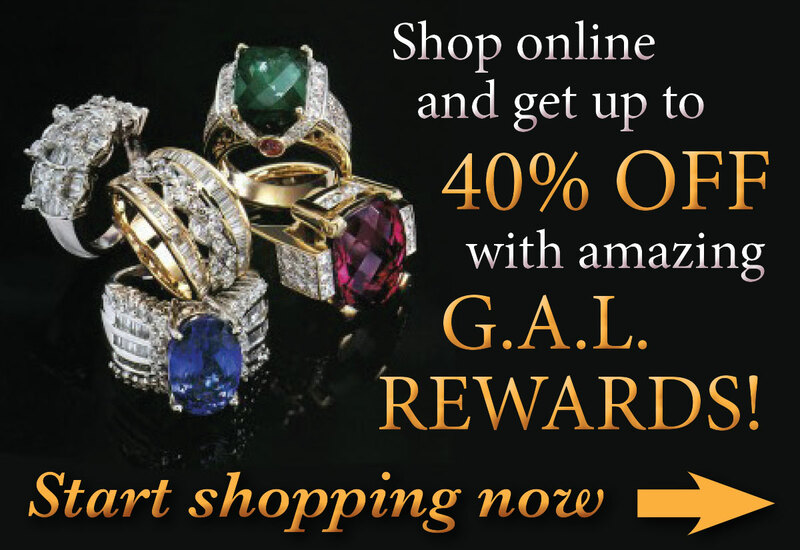 Hmmm, seems to me that we’ve been dealing for years, in the gem business, in unobtainium—for millennia. Take for example the aquamarine in the photo. 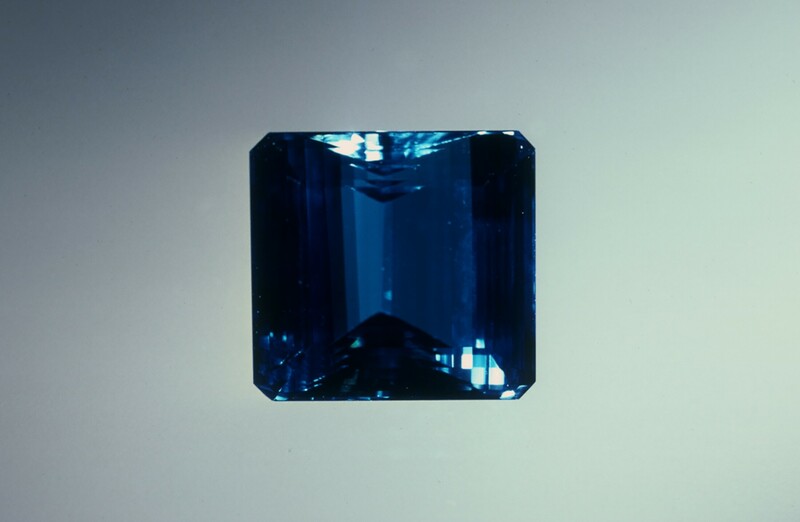 At over 70 carats and top color please just try to find its equal. Eventually over a few years of looking it might be possible. A few years ago we were looking for a similar gem for a client while attending the Tucson Gem and Mineral Show. We, of course, know the biggest and best aqua dealers in the world. There was nothing that year in top color available over about 10-12 carats. The mines had simply not been producing. Of course, the truly fun thing about the gem business is that an item impossible to find today might pop up in a mine somewhere tomorrow. Lots of adventure!!! The aqua in the pendant at a high end retailer who would carry such a piece would easily charge over $350,000 for the stone or more. But really, based on its rarity it should be more. Aquamarine is one of my favorite gems. Of course with me, talking about my favorite gemstones is like asking a parent about their favorite child—whichever one I’m thinking about or talking about at the moment is the favorite. Still, aquamarine is right up there in my true favorites. This blog is brought to you by Ramseygems.com Inc., which is solely responsible for its content.